There is no denying that I LOVE chocolate which is probably why I love these chocolate desserts. 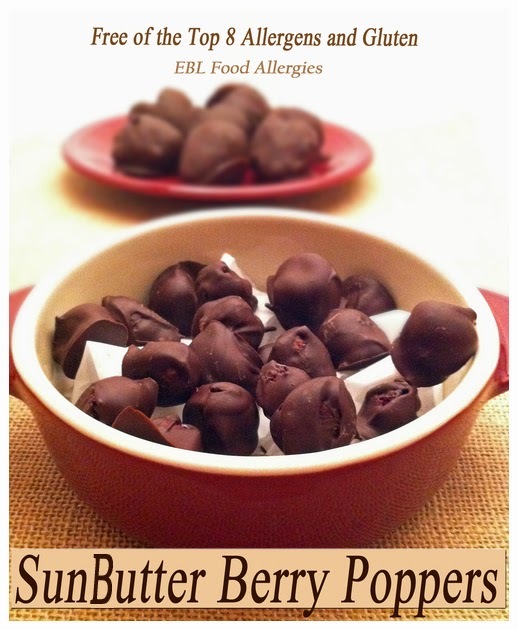 I made chocolate covered SunButter® filled berries. Oh my goodness are they yummy! I made a big batch and kept them in the fridge, free for the taking. I probably ate the most but I couldn’t help myself. Can you blame me? I scooped SunButter® into a sandwich baggie and snipped a tiny piece off the corner of the bag. Then I used frozen raspberries (which are already hollow) and slowly squirted SunButter® into the berry and dropped them into the melted chocolate. 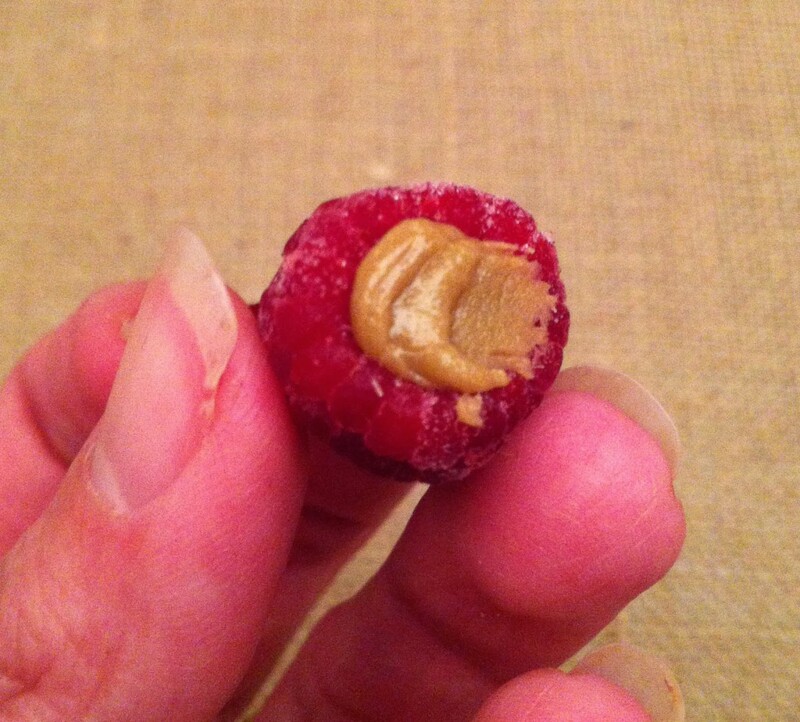 Using a toothpick I turned the berry around and made sure to coat it entirely and placed it on waxed paper to cool. The result? Delicious chocolate treats that are gluten-free and top-free*. Empty one bag of allergy-free chocolate into a double boiler and cook on low heat. ( I used a small metal bowl on top of a small pot of water, making sure the water does not touch the bottom of the bowl) You can also melt your chocolate in the microwave but I prefer the double boiler because it keeps the chocolate at the right consistent temperature. Line one cookie sheet with waxed paper. Add SunButter to a small sandwich size plastic bag and cut off one tiny corner. This makes a small bag to pipe the SunButter into the berries. 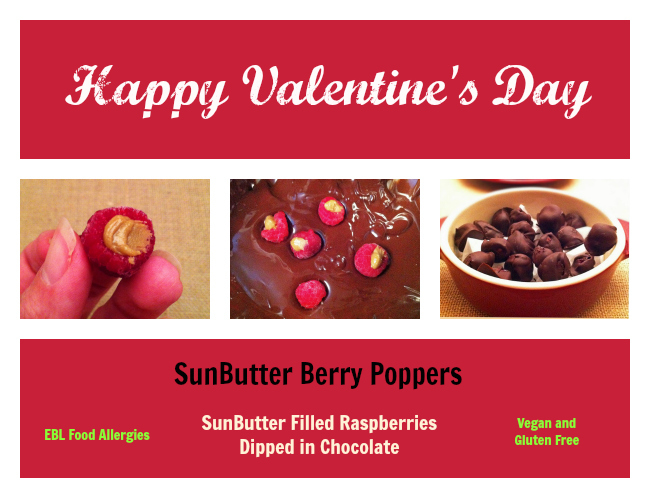 Slowly pipe the SunButter® into the hollow part of your berry and put aside. 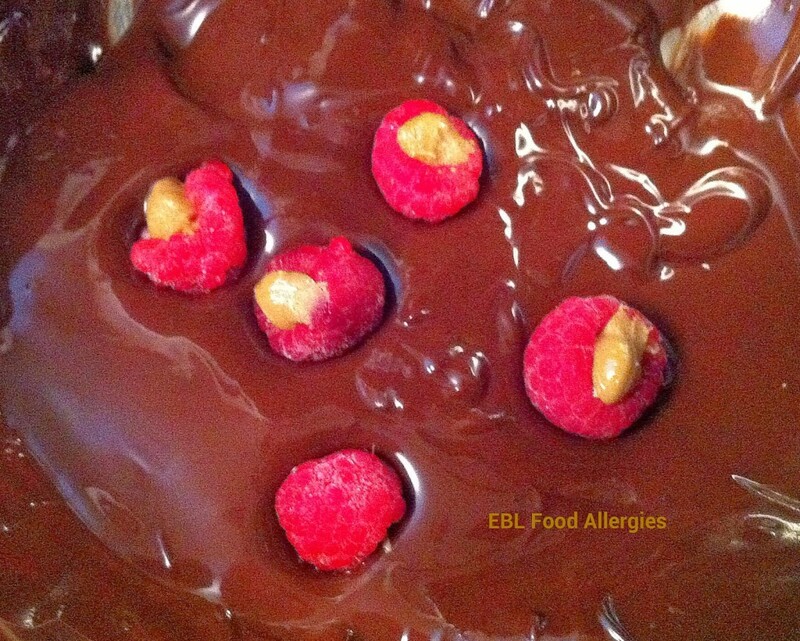 Add the filled berries into the chocolate 4-5 at a time and slowly turn until they’re completely covered in chocolate. 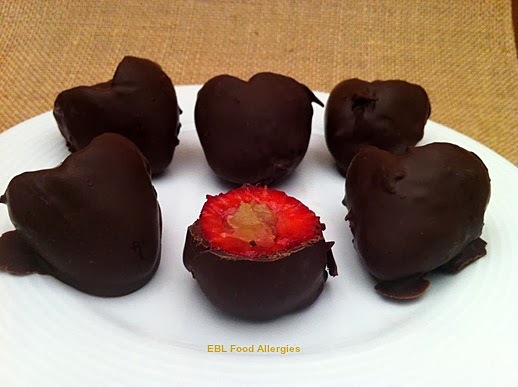 Place the berries onto the waxed paper and place them in the refrigerator allowing the chocolate to set. I also made chocolate covered strawberries which wasn’t quite as easy to make. I used fresh strawberries and had to scoop the middle out to make room for the SunButter®. The result was delicious but more time consuming. Get ready to have kids with chocolate fingers and chocolate faces for the next few days… 🙂 Okay, okay…if you’re anything like me, you’ll have chocolate all over your fingers too!!! But it’ll be worth it!